It takes a lot of persuasion for me to actually try a new burrito or taqueria spot because I think my two favorite spots are well placed on my burrito pedestal: La Palma (see post HERE) and El Farolito (see post HERE). 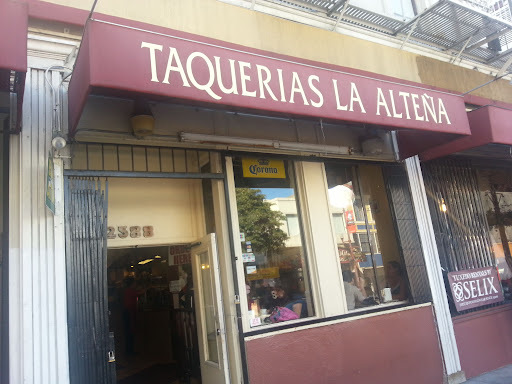 Taqueria La Altena is one of those taquerias I must have passed by hundreds of times on my way to El Farolito without even glancing in. I had heard about this spot and their amazing al pastor freshly made while marinating in its own juices on a spit. Walking right in, I had high hopes for this spot. True to the rumors, you see well piled slices of pork on a spit. On an even better note, there was a line for this place in the middle of the day and no one in line spoke English. I came here for one thing only: the al pastor burrito. Usually, I prefer my al pastor on a taco so this was one of the few times Ive actually had it in a burrito. The al pastor was juicy and tender, so tender that the pork almost seems like it was stewed instead. Even in a super burrito with all the fixings, the meat is the most dominant ingredient so those that aren't a fan of rice might dig the burritos here. Although the meat was dripping with sauce, I didn't find the meat to be too flavorful and a tad too salty even by burrito standards. A nice venture and I wasn't too disappointed, but I think I'll stick to my favorites for now.